I love ordering stationery. It’s my secret little addiction! I like hand-writing thank you notes and I like personalizing cards, invitations, and labels. 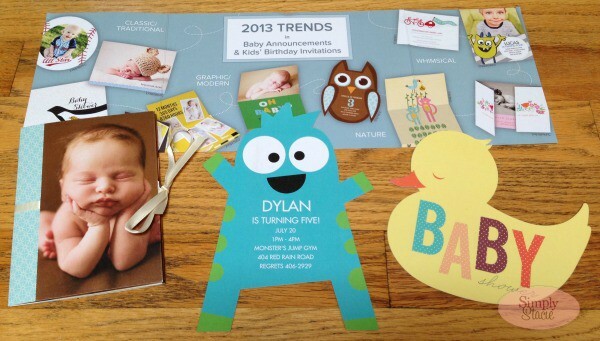 I have used Pear Tree Greetings for many occasions in the past, but have come to discover a whole new level of personalization options from their kid and baby collections. 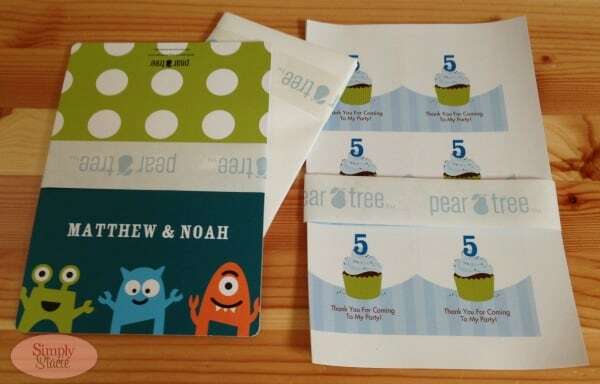 I received a $30 credit to spend on products in the Pear Tree Greetings kid and baby line. My oldest son’s birthday is coming up fast, and I’m pretty well prepared for it. 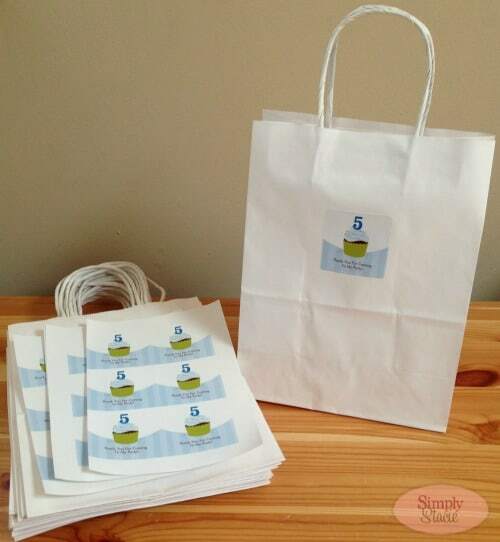 But I found something on Pear Tree that I thought was cute and perfect for the goodie bags I bought for the party – Kids Birthday Favor Stickers. These is the perfect solution for the plain white craft bags that each kid will get filled with Matthew’s favorite little toys and books. I chose the Sweet Sprinkles in Blue design because I thought it was simple and classic. I think it adds a nice little something extra to the party bags. I think they’d also be a nice envelope sealer for thank you notes too. These stickers are 33 cents each, and start at a minimum of 12 stickers. After personalizing the stickers, I went to browse the Kids Thank You Cards. I always like to have thank you cards on hand because you never know when you’re going to need them! I like to keep some non-birthday, non-holiday themed cards handy for when guests come over who might bring a gift for my boys, or for when someone does us a favor. I liked a lot of the designs Pear Tree has to offer, but thought the Little Monsters in Blue was fitting for my two little monsters. 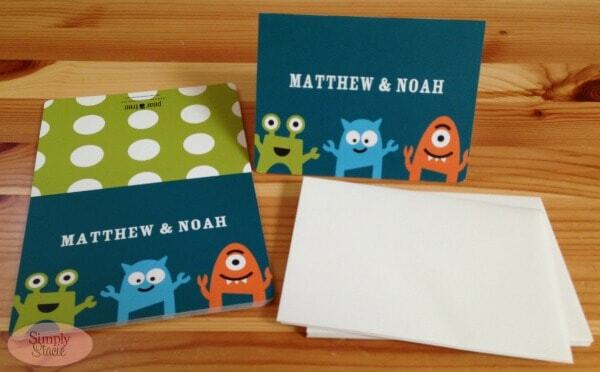 These cards are blank inside which makes it perfect for any occasion. These cards start at $1.72 each for 8 cards, and go as low as 80 cents each depending on the quantity you need. The great thing about the cards, as well as the stickers, is that they were a breeze to personalize. You can choose the fonts, the sizes, color, and placement of your text, and you’ll get a preview of exactly what your printed piece will look like. If you’re interested in adding photos, you can upload pictures from your computer or even right from your Facebook account. Pear Tree Greetings is a one-stop-shop for all your kid and baby needs. From baby shower invitations to birth announcements, 1st birthday invitations to kids birthday invitations. To see everything Pear Tree has to offer, visit their website. I like the Wild Night Out – Lipstick Birthday Party Invitation. I like the Notepads — Hello Purple Glitter. I love the save the dates! I love the save the date magnets! I like the graduation invitations, my daughter will graduate in May. I really like the NOTE CARD SETS since I like to write and send the occasional but personal notes (and thank yous). I like the sweet calligraphy table decor for weddings! I like the Glittery Purple Stripes notepads! I love the selection of Christmas cards. I like the Notes from Mom. The flowing ink notepad is neat. I like the Make a Wish thank you cards. I love the Oval Ornament Christmas cards! I like the Bordered Blossoms address labels.